I was staying in Mayapur when we decided to install Lord Nrsimhadeva and at that time I was responsible for all the construction in Mayapur. So we were all in great anticipation- ‘Nrsimhadeva is coming!’ I had the good fortune that I was allowed to construct His little temple and oversee that construction. We were also unloading the Deity who came in a truck filled with sand; the Deity was lying basically in sand. Then we dug out the Deity, which was 450 kilos! So it was quite a thing to take Him out without a crane but my man power! But we did it. Maybe about 12 men lifted Him up and placed Him on the altar. So I was very happy that I was somehow or other allowed to serve the Deity from the very beginning, from when the Deity came. Although they said a grhastha shouldn’t go on the altar of Lord Nrsimhadeva because He will destroy your grhastha life, I didn’t mind (Laughter). So from the onset I had a relationship with that Deity, a relationship of service. So it carried on but then with time they asked me to change my service and take charge in Vrndavana. And there I got some real purification after a number of years, with a bullet in the back and so on, which is sort of the heavy side of the Lord. Then after I recovered, I came to Mayapur and then I came in front of Lord Nrsimhadeva and I was scared of Him, for the first time! I was really scared of Him and I was thinking, ‘boy, are You heavy!’ It sounds very nice when Sacinandana Maharaja explains it like the piano won’t fall on your head, but I tell you, I stood in front of Him after the piano just landed! (Laughter) So I was a little scared of Him at that time. So it took some time to really think deeply how compassionate Lord Nrsimhadeva is. They annihilate the demons and they establish the principles of religion, and Krsna also. Although Krsna has His other pastimes in Vrndavana- His personal pastimes, the pastimes in the spiritual world- but that killing of the demons is going on everywhere. So then we see that Srila Prabhupada points out that this Nrsimha Caturdasi is one of the main celebrations in the year. 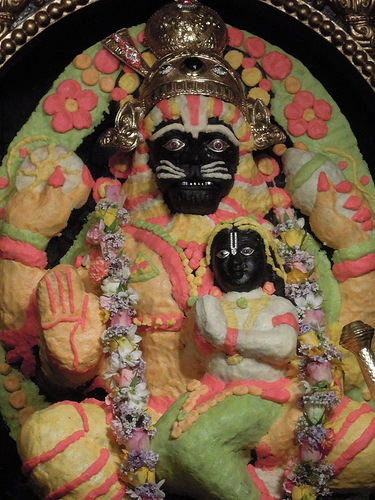 Lord Nrsimhadeva is one of the main principle manifestations of the Lord. Thinking about it, it came to my mind that when Lord Vamanadeva is doing His tricks, He tries to do so to reclaim the universe from the demons for the demigods (the devotees) so that the order in the universe will remain intact and so everyone is in his proper place. Ultimately, spiritual knowledge will remain protected within the universe. In other forms the Lord also does that: He helps to save the Vedic literature, the Matsya avatara and so on. But in the appearance as Lord Nrsimhadeva, the Lord appears really for one devotee. Of course, extended for all devotees but in the actual incident, for one devotee only. That is His motive, that is the very reason why He appears. He is the most personal; He is very personally dealing with the devotees. It is then not surprising that Jayadeva Gisvami is writing, bahir nrsimho hrdaye nrsimhah, outside He is there stopping the demoniac forces undoubtedly and internally He is there within the heart as vigna vinasana, removing these obstacles from the heart. So He’s very personal with Prahlada and with all of us also. His whole appearance- His teeth like thunderbolts and all His nails and very harsh appearance- is a symptom of extreme soft heartedness because of His extreme anger when His devotee was in danger. So the hardness on the outside shows the depth of how deeply He cares for His devotees. When I start to contemplate on that I think, ‘all right, He may have just arranged a bullet, which is sort of something intense and somewhat hard. But then if I see the hardness of my head because I’m such a hard-head and such a stubborn person, then I don’t think anything lighter might have worked.’ So it’s not always in the process of becoming purified ion Krsna consciousness that the purification is light, it is not always soft. He may be soft in His purification, He may also be strong in His purification, but He will also provide us with a very personal path, a path that is designed for us. It’s not that everyone get’s the same; one gets what suits ones nature and ones particular situation. And in this way, whether we are receiving the mercy in a mild, gentle way, or receiving the mercy in a strong way, we can have that faith that Lord Nrsimhadeva is dealing with us in a very personal way. He has no other desire than to bring us to that state of pure love of God. In this way we have to place our trust in Him. Even more so than Krsna, Lord Krsna is emerging as the protector. Krsna is the protector when He kills so many demons but Krsna is doing it in an almost playful way and at the same time displaying all His various opulences- He dances, while He is on the hoods of Kaliya. So it’s not just chastisement; His focus is not just the chastisement of the demon but His focus at the same time is to display His opulences as the Lord in the spiritual world. But Nrsimhadeva, His whole focus is just His incredible, deep, deep compassion, which is translated as pure, unadulterated anger. There’s nothing else in His mood! It’s that in relation to Hiranyakasipu. Satsvarupa Maharaja, who wrote so many books (I’m not even sure how many), but one that he wrote, he asked a fundamental question, and the question was the title of the book- “Am I a demon or a vaisnava?” which we may secretly also have in our heart. We may wonder, ‘well, is there a little Hiranyakasipu in me? And if that is so, then how will He treat me? Who will He deal with? Will He deal with the Hiranyakasipu in me or will He deal with the devotee in me?’ So again, a reason to be afraid of Lord Nrsimhadeva. Then we are judging the situation from our own human perspective because we should not forget that the Supreme Lord is extremely generous by nature and His inclination is to see even the smallest service as something very substantial. In this way, even a small service rendered by a vaisnava is taken by the Lord as of great significance. Therefore He accepts us as a devotee. Then these remnants of impurities, He’s assisting us, He’s helping us to become purified in a way that is ultimately not going beyond what our capacity can deal with. Bhakta vatsala, the protector of the devotees. The Lord is not going to test His devotees beyond the capacity that they can manage, although at times He may make it a little difficult. But within that, we get so much purified and gain so much strength. So we must trust that the Lord is truly our best friend. Srila Prabhupada said that the Lord is our best friend and the devotee said, ‘no, Srila Prabhupada, you are our best friend.’ And Prabhupada said, ‘no, I may disappoint you because I am not omniscient and I’m limited but Krsna is omniscient and He knows everything and He’s completely our well-wisher.’ Therefore, there is nothing to fear. He is our best friend at all times and at all time He will take us. His only desire is that we will go back into His association eternally and as soon as possible! That is His desire. Therefore there truly is no reason to fear Lord Nrsimhadeva but rather we are very happy to turn to Him knowing that He protects us. bahir nrsimho hrdaye nrsimhah, He protects us from outside, negative forces and He also protects us from ourselves, to save us from sinking down in the material swamp. So in that way we are very eager for that protection and we pray again and again here, to Lord Nrsimhadeva on His appearance day, to free us from all the material entanglement and uplift us and take us back quickly in the eternal association of Krsna.